Unfortunately California Guv Jerry Brown vetoed AB714, the Roman Reed Act that would have greatly supported spinal cord research. Roman Reed is of course a top stem cell patient advocate and driving force in research. 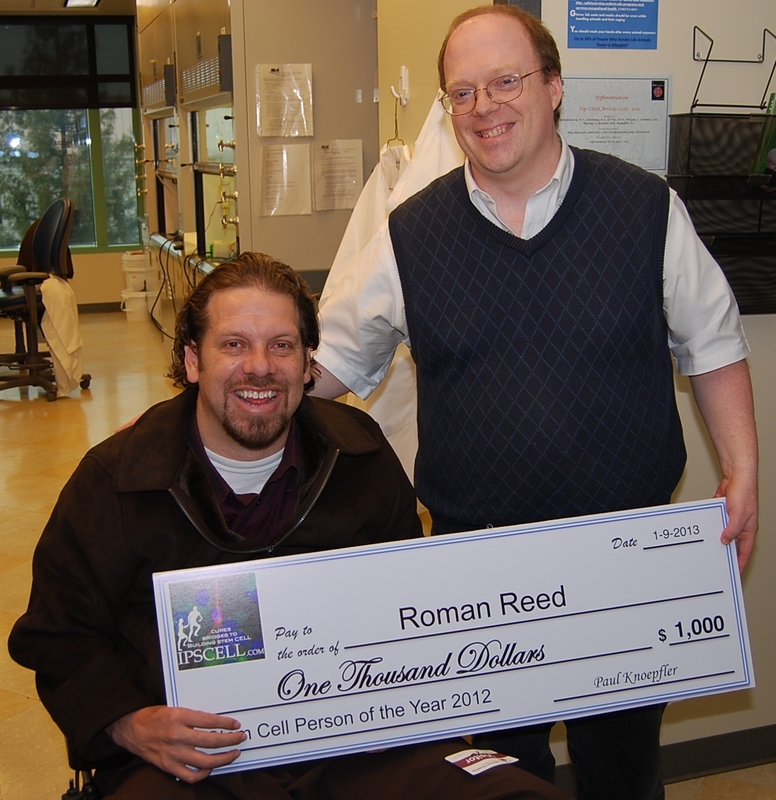 Roman received my Stem Cell Person of the Year Award last year (See picture at right). The contest for the 2013 Award is ongoing now. You can vote for your favorite candidate to be a finalist. Below is my interview with Roman on Brown’s veto. 1. Please briefly summarize for us the goals of AB 714 and how it would be funded. How is it similar and different from last year’s bill? Reed: The goals of AB714 are simple: to provide $1 million in general funds for the funding of the best science in California to move forward towards achieving our goal of paralysis cure. We put the money into a general UC system account located at the UC Reeve-Irvine Center. Then scientists make grant proposals, we grade each proposal and only fund the highest scored best science. As Dr. Hans Keirstead says “Let the science lead”. Roman’s law has been in place since 1999 signed by both governors Gray Davis and Gov. Arnold Schwarzenegger. What we have accomplished has been monumental. Roman’s Law provided the funding for America’s first human clinical trials for embryonic stem cell research. We employed over 600 Californians. And, brought over $100 million into the field of paralysis research. Granting $15 million directly and attracting an additional $85 million in matching grants from out-of-state sources, new money for California. We created jobs, economic return and moved the entire field of paralysis research forward. 2. AB 714 had near universal legislative support, correct? Reed: Roman’s Law AB714 passed the California State Senate unanimously with full bipartisan support! Every Democrat and Republican in the entire Senate saw how important AB714 was to help cure the paralyzed. After passing the Assembly overwhelmingly by a 63-4 vote. Leaders from both sides of the political aisle saw clearly how important and vital it is to fund research for paralysis cure. We spend more money every year taking care of our chronically injured in our country than we receive in total combined taxes both personal and corporate annually. This is not sustainable for our country, we must find cures. 3. What is your reaction to Brown’s decision to veto the bill and his explanation of his reasoning in the veto message? Reed: I am disgusted and determined. Disgusted that anyone, let alone a Governor, would veto the hopes of curing the paralyzed. And, determined to do whatever it takes to correct this wrong. 4. Given that Brown has now vetoed this bill two year’s in a row, where do we go from here? Thus, I’m going to win state office and help make the medical Laws from within the Capitol. I will need and appreciate all of your support everyone. We will be launching www.electromanreed.com this week. Curing the paralyzed and finding medical cures is the most important task of our lives for the health of our loved ones and the economy. Some fights we just have to win and together we can. Millions of People are depending on our success. All for Cure & Cure for All! Together, we shall make cures happen. I am Roman Reed and you have my word on it. Paul – What reason did Governor Brown give for vetoing the bill? It obviously wasn’t a partisan issue, so unless I’m missing something I don’t understand the veto given the job creation and grants that were mentioned. I recall reading that Christopher Reeve said “I wish I was a rat” when he heard of the progress that had been made repairing spinal cords of rats. Personally, I think that the Governor is behaving like a stingy rat.